I usually only do reviews of brand new products. This is an exception. Peanut Butter Toast Crunch originally appeared in stores in 2004. It disappeared for a while and now suddenly, it is appearing in stores again with the word "NEW!" prominently displayed on the box. The back of the cereal box urges consumers to "taste peanut butter perfection." It's not exactly perfect, but it is really good. The peanut butter flavor is more authentic than its closest competitor, Cap'n Crunch's Peanut Butter Crunch. It's less candy-like. When eaten dry... and I hope this doesn't sound gross... if you chew it up to a mush, the mashed and mutilated cereal actually tastes and feels a lot like peanut butter in your mouth, just maybe not as sticky. In milk, the flavor is delightful. As the box says, it really is "rich (and) creamy". It also says it's "dreamy" but I wouldn't take it quite that far. As for crunch, it's there if you want it. As with it's brother cereal Cinnamon Toast Crunch, the cereal is decently crunchy if you eat it immediately after pouring milk. But for those of us who like a tender crunch with pockets of softness, just let the cereal set in milk for two minutes and it takes on a different texture profile. If you like peanut butter cereals, rejoice. One of the best ones ever is back. Nutritional Considerations: Each 3/4 cup serving has 120 calories, 3 grams total fat (0.5 grams saturated and 0 grams trans), 0 mg cholesterol, 170 mg sodium, 23 grams total carbs, 2 grams dietary fiber, 8 grams sugar and 2 grams protein. What do you think of Peanut Butter Toast Crunch? I am sad it is gone. Sadly, some boxes tasted old while others were the cream of the crop. I still want it like the first go around. Absolutely horrid. I once opened and inadvertently ate Healthy Choice cereal that had insect larvae in it, and forced to chose, I would take the bugs. Terrible aftertaste. Worst cereal I have ever had... so disappointed... It was VERY weak peanut butter flavor. I have never thrown out cereal in my life until now. I wish I could get my money back or at least trade for some other cereal. I love it! Huge peanut butter fan, and I think it tastes more like peanut butter than the other sugary peanut butter cereals - Cap'n Crunch & Reese's Puffs. I just ran out and want to go buy two more boxes. I guess some people hate it and some people love it. Oh well, more for us that will buy it! I want my money back! I thought this cereal was nasty! I'm sorry, but I disliked this cereal. I have always enjoyed Cinnamon Toast Crunch, so I thought this would be good too. As I walked into a Grocery Outlet months ago, with peanut butter being my all-time favorite snack food, I thought, 'it ought to be good'. They didn't have Post Peanut Butter Crunch (which I really, really like) so I said to this, 'why not?' It was discounted for $1.69 for a 12 ounce box, so I bought two. I took them home and ate some out of the box. Aargh! The first thing that came to mind? Peanut Butter throw-up. But I opened it already, and I hate to waste food I buy, so I just decided to deal with this one. I chose to stay away from it for about a day to see if my Peanut Butter Crunch bias would wear off. I tried it again, this time in milk. More often than I'll admit, I found myself adding a 'cereal chaser' like Cheerios or Shredded wheat to dilute this awful throw-up tasting product. I was talking to my landlord about this terrible food when I opened the 2 box, unaware that had I stopped to think about it, I could have returned the then-unopened Pandora's box of awful. It took 3 weeks to finish this borderline okay/awful product. By contrast, I go through Peanut Butter Crunch box in 2-3 days. My fairest evaluation of this cereal is that, it really WANTS to be Peanut Butter, wants to convince you of its content. But it really fails. And anytime I put up with the taste, was just to bide my time until the last piece was... *ulp*.... eaten. I'm sticking to Peanut Butter Crunch. Oh wow, I could make better cereals than this. When it first entered my mouth, it tasted like dry cardboard. Come on... make cereal that's actually edible. Thank you, MrBreakfast.com. The petition on your site is the straw the broke the camels back! General Mills finally submitted to the will of the people. NOM-NOM-NOM!! I couldn't even finish my bowl and I love cereal and peanut butter. My 9 year old son was even saying it was sick. He dumped his bowl out too. I think it tasted like peanut butter coated dog food. Stick to cinnamon toast crunch. This cereal taste bad. It does not taste like peanut butter and the color is so artificial... what a waste of money. When I purchased this Peanut Butter Toast Cereal, I was very excited but I have been very disappointed. My husband was the first to taste it, and he loves peanut butter but he thought this cereal was disgusting. So, shocked, I tasted it and first off, it smells like dry dog food, no offense, and it taste like it too I would guess. I will not buy this again, as a matter of fact, I wish I could have my money back. Thank you General Mills! I LOVE IT! I'm so glad it is back... there is no other peanut butter cereal on the market that is truly peanut butter! It's the Best! You have NO idea! I went everywhere to stores buying out all the boxes I could find when it got discontinued before. I'm so happy that it's back! I thought there would be cinnamon. Not good at all! This is the worst cereal ever. Disgusting. This is a good, solid addition to the General Mills cereal line. It's not quite as good as the awesomeness of Frosted Toast Crunch, but I think it's actually better than original Cinnamon Toast Crunch. I did find it to have a slight chemical aftertaste and I still think Reese's Puffs is the best peanut butter cereal of all time, but overall I can't complain. It's certainly better than the terrible Peanut Butter Cheerios that came out a while back. Are you guys high? This cereal is terrible and it left a bad taste in my mouth. It does taste like peanut butter though... the worst peanut butter I ever tasted. Best new cereal in a year, has been a staple of mine for a few weeks now - definitely better than the first version of PB Toast Crunch from a few years back - not sure what they changed, but they seem to have really gotten it right this time. I was so excited when I saw this! I just got done eating my first and what is sure to be my last bowl. Truly had to force myself to finish it, hoping it would get better. I absolutely love cereal and anything peanut butter flavored. This stuff however was just gross. I can't even figure out what it tastes like other than to say it's gross. Big huge disappointment. I LOVE peanut butter flavored cereals. However, I like peanut-butter flavored CEREALS, not cereal that's seemingly covered with so much peanut butter that the cereal part is incidental. Eaten in a bowl of milk, it tastes like... pure peanut butter with milk (and a bit of crunch in the middle). It is not sweet at all, and has a savory, rather than sweet, taste. Captain Crunch peanut butter is very sweet and candy-like (too much so, I feel). Panda Puffs are lightly peanut-flavored. This cereal IS very, very rich and creamy, but if you're looking for a peanut butter flavor, not straight-up peanut butter, this isn't the cereal for you. I actually find it quite palatable and sweet IF mixed, in the same bowl, with Cocoa Pebbles. The Cocoa Pebbles provide enough sweetness to add just a tinge of sweet flavor, but not overpoweringly so (and the cocoa flavor melts away). 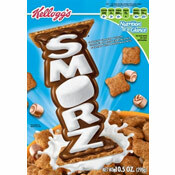 For those who find this cereal TOO peanut buttery, just add a bit of single-flavor sweet cereal to the bowl and enjoy. If you're a peanut-butter purist, you've found a goldmine. This is one of those cereals that apparently is an acquired taste. I was excited, thinking it would be close to Peanut Butter Cap'n Crunch. It's more like peanut butter Captain Krunk. To my taste buds, it's terrible. I couldn't even finish the first bowl, got halfway through and and was done. Peanut Butter Toast Crunch? Where is the peanut butter? This tasted like cinnamon toast crunch without the cinnamon. There was no peanut butter taste to it at all! I love this cereal. It's my new favorite cereal, and by far the best PB cereal on the market today beating out the PB Cheerios, Cap'n Crunch, Reese's Puffs and Puffins. This cereal is the worst thing I have ever tasted in my life. I felt as though I were directly eating waste. 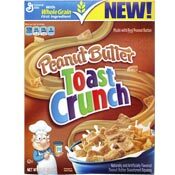 Thank You General Mills for bringing back Peanut Butter Toast Crunch! It is the best!